It is no easy task recycling and grading vintage clothing in bulk to provide to vintage clothing boutiques world wide. When it comes to collecting vintage clothing from the United States the Japanese buyers have been paving the path for nearly 30 years. Since the eighties Japanese vintage collectors have been traveling across the United States hitting up thrift stores, vintage stores, clothing flea markets and just about anywhere they could find old vintage jeans, leather jackets, sneakers or t-shirts. As the vintage clothing culture became more popular in Japan and the demand grew collectors began to find new ways to locate more product. Because each vintage piece is essentially a one-off it is difficult to determine the actual size and fit without trying it on. One problem the collectors had was finding vintage pieces that were not only the correct size but the way the garment fit had to be perfect as well. To overcome this obstacle they hired hip Japanese boys and girls that were the perfect body shape to match the sizes that they were looking for. Finally a warehouse for vintage shop owners! We created the online vintage warehouse with you in mind. We are glad to have you check it out. Some of Our Best Sellers! We have a Special Running with a $350 Order Minimum for Online Order Only! RETURN CUSTOMERS: Please feel free to shop our collection and add objects to your cart, or should I say bin. You will get a email confirmation when your order is received. NEW CUSTOMERS: If you do not have an account, feel free to look around but be advised before hand you will need to open an account before your order is approved. Over the years Dust Factory has bean the leading supplier of American recycled clothing, aka Vintage. We cater to designers seeking inspiration, vintage boutiques and stores, remake companies, department stores in need of larger quantities, online sellers and exporters. 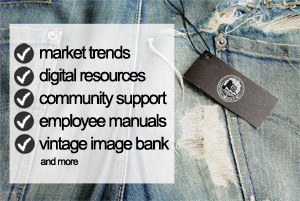 Many of our accounts use our knowledge of the vintage industry to their advantage. By using us as a bulk supplier, they can better idea of whatâ€™s selling around the world, and how to price, merchandise and better push their vintage finds. Itâ€™s the combination of great clothes and knowledge that make store successful. Dust Factory is unique in that we have the ability and knowledge to prepare orders for you. Family owned and operated we are an environmentally conscious fashion forward experienced and tested used clothing wholesaler with no appointments necessary come on by and check us out ! When vintage shops customers were narrowed between theater students and collectors, buyers didn’t have to continuously re-fill their racks. As the market grew so did most buyers strategies. Buyers for Vintage Clothing Stores in the past are different from the buyers of today. When vintage shops customers were narrowed between theater students and collectors, buyers didn’t have to continuously re-fill their racks. As the market grew so did most buyers strategies. It seams some buyers are content with their techniques from the past, while others are forced to obtain their merchandise in other ways. Differences between the time and resources that the actual vintage buyers have, will predicate how and what type of merchandise each shop will carry. Some buyers choose to get their pieces by continuously spending there weekends hitting up vintage swap meets, garage sales, or estate sales. Everyone at one time or so, vintage collector or not, has spent a Saturday or Sunday morning driving from garage sale to garage sale. Some times it pays off and the buyer can find great eclectic pieces through shopping this way, but more times than none they’ll spend hours upon hours sifting through piles of clothes, or whatever the hunt is for, in peoples front yards to come up with a couple of pieces or none. A vintage collectors time is valuable, seeing how most buyers are in fact shop owners, and would rather spend time at there shop where they are needed most, instead of peoples yards. Vintage Clothing Swap Meets are a good alternative, if a city near the buyer even hosts one. Unfortunately most vendors at these swap meets are in fact shop owners themselves, trying to sling there second hand dead stock* for cheap, while they sell there good vintage merchandise at a retail price. Sometimes good deals can be found, but again, the time and effort to sift through these swap meets can be demanding, leaving buyers to many times empty handed. Most Vintage buyers that need to purchase in bulk, skip over garage sales and vintage clothing swap meets completely, and go directly for the source. They hit a rag house, the end of the rode for most clothes. Rag houses are warehouses that collect every charitable clothing item that anyone, anywhere, has ever given away. They are kind of like the manufacturer for the vintage clothing industry, if you can accept that they are not actually manufacture anything. They are instead more like the ultimate supplier for the industry. Although supplying for vintage buyers is not what the company are set up to do. Some donated items are picked out and sold in second hand thrift stores. Nonetheless, it seems that more times than none, the clothing ends up at a rag house that will bail it, weigh it, and ship it to another country. Vintage shop buyers have bean hitting up rag houses for years now, asking them to sift through there merchandise and pull out pieces that would sell in a shop. Many rag houses have found that it is indeed profitable to separate vintage pieces from the rest of their rags, to sell to vintage collectors. For a little more per pound than the average bails, a vintage buyer can purchase 1000-pound bales of merchandise that they need for their shop. This is a better solution than hunting down single pieces at garage sales or swap meets, but it still leaves a lot to be un-desired. Created by a team of lawyers as a template for small business retail shop owners who hire employees. Enjoy over 23 pages covering important topics like work behavior, health & safety and trade secrets. Don’t let your store be the victim to a out of control employee. Protect yourself and your other employees by creating a fun safe work environment. Download our Free Employee Manual Today.